PAJU, South Korea, Sept. 11 (Yonhap) — Kia Motors Corp.’s Niro electric vehicle is one of the best options on the market for drivers wanting to save the environment and cut back on transportation-related outlays. Over a 100-kilometer-long course taking some two hours, the Niro EV powered by a 64 kilowatt-per-hour battery logged an average of 6.9 km per kWh, with the pure electric drivetrain rated by the government to have a range of 385 km on a single charge. 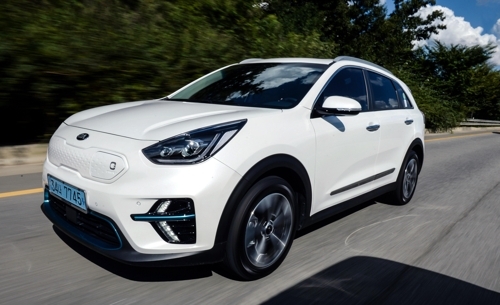 With the launch of the Niro EV, Kia has strengthened its all-electric car lineup currently composed of the Ray EV city car and the Soul EV box car, which both have much shorter ranges. The Niro also comes in gasoline hybrid and plug-in versions. Absent the roar of an internal combustion engine, the emission-free car effectively ran silent at low speeds, although some road and wind noise seeped into the cabin when moving down the road at a brisker pace. The tester was able to accelerate to 100 kilometers per hour from zero in a good 7.8 seconds, thanks in part to the vehicle’s light weight of 1.8 tons. Its height of 1.6 meters and lower center of gravity caused by the battery pack allowed for agile and stable cornering. The Niro EV is moreover equipped with the latest safety features such as front collision avoidance, rear cross-traffic collision avoidance and blind-spot collision avoidance warning. In terms of the interior layout, all the buttons were easy to reach and intuitive to use, although the quality of the materials on the center console, dashboard and doors looked less premium. The Niro EV is part of Kia’s broad plan to add 16 environment-friendly vehicles — five gasoline hybrid, five plug-in hybrid and five all-electric models, and one hydrogen fuel cell car — to its lineup by 2025, Kia Executive Vice President Kwon Hyug-ho told reporters on the sidelines of a media test-drive event. “The company aims to launch a Niro EV which is capable of traveling more than 500 kilometers per charge in 2020,” Kwon said. Kia plans to introduce the latest version of the Niro EV in the United States and other global markets, the executive said without giving a time frame. The company has received orders for 8,500 Niro EVs since its launch in July, more than doubling this year’s sales target of 3,800 units. It offers a 10-year, 160,000 kilometer guarantee to customers. The Niro EV is priced at 48 million-50 million won (US$43,000-$44,000) in the domestic market. With government subsidies worth 17 million won, the car can be had for 31 million-33 million won depending on the trim.